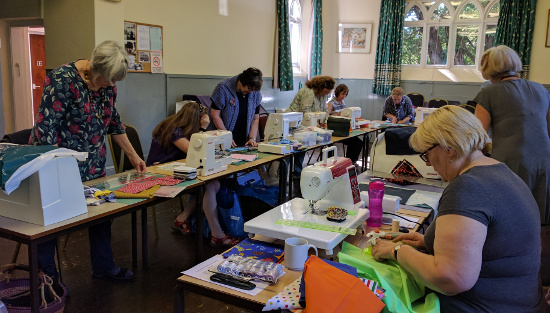 My workshop on Sunday 7th May was busy. Free-cut curves differs from standard piecing methods in that you use a rotary cutter and mat, but no ruler. Hence the name Free-cut Curves! I have a lovely group of quilters. I know some but met others for the first time on Sunday. A few of the group live locally, but Maggie, Anne and Julia travel 100 to 140 miles for my classes and workshops. Jill however, drove over 570 miles from Southampton and back, staying in a B&B just to do my Free-cut workshop. I feel very honoured. Thank you Jill. 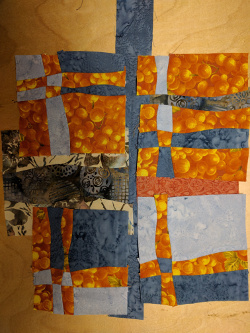 You can’t plan exactly what your quilt top will look like using the free-cut piecing method. You have to develop your ideas as you go. Once you get into the method, it’s very liberating and great fun. The day went by very quickly and the results were individual and very interesting. My next workshop will be on Sunday 14th May when I will be teaching Wholecloth Quilting. 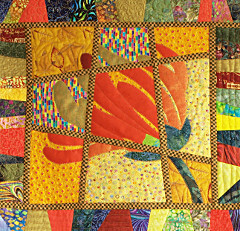 This form of quilting is very traditional and totally different from Free-cut Curves. Some of the people doing Wholecloth with me have just done Free-cut Curves, so I’ll have the pleasure of their company again on 14th. This entry was posted in Blog and tagged Free-cut curves, workshop on 8 May, 2017 by admin.